Based on data from Pantone’s website, I was able to plot the color in CIE 1931 (xy). As you can see in the chart below, Pantone’s color is well outside the sRGB/rec.709 color gamut standard used by most HDTVs, the new iPad/iPhone and many desktop monitors. These devices will be stuck showing a version of Pantone’s emerald green that’s less saturated and probably a bit more yellow than the real thing. This is a perfect example of a popular real-world color that falls outside of the sRGB/rec.709 gamut. 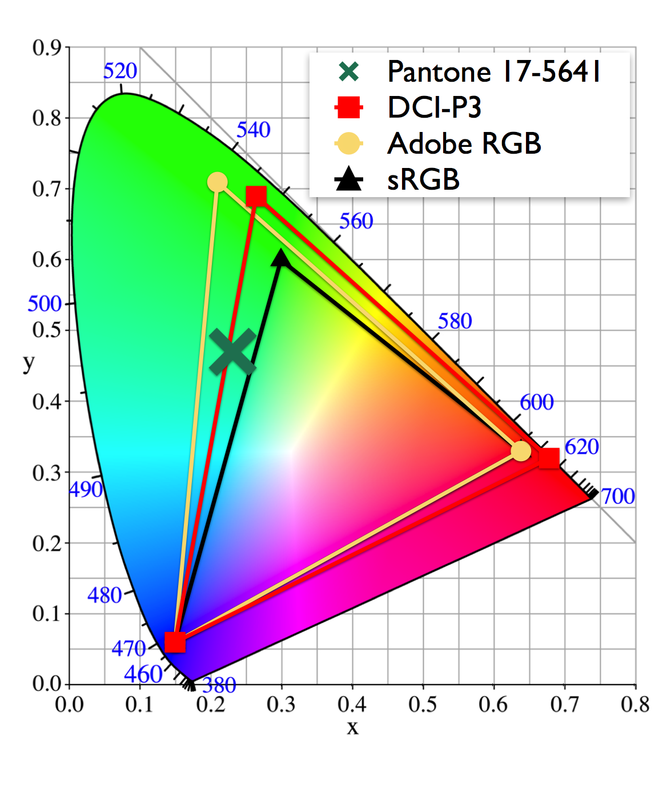 Unless you have a monitor that’s able to show wider color gamuts, like the DCI-P3 or Adobe RGB standards, you are missing out on a great color. This entry was posted in Color gamut standards, Color science, Display Industry Trends, Display measurement and tagged Adobe RGB, arts, CIE 1931, color, color accuracy, Color gamut, color standards, display technology, HDTV, iPad, iPhone 5, Pantone, sRGB, technology by Jeff Yurek. Bookmark the permalink. I work at an advanced materials company called Nanosys that manufactures Quantum Dots for displays. In my work the display business, I’ve noticed a lot of confusion around color science and image quality. I’ve started this blog as a way to get to the bottom of some of this stuff and share what I’ve learned. My aim is to synthesize information I’ve accumulated in order to provide a useful way for us to understand why great color is so important and exciting. Could you please tell me with which software (or else) you have used to plot these data? I sometimes do need to make something similar, and didn”t find the tool yet.